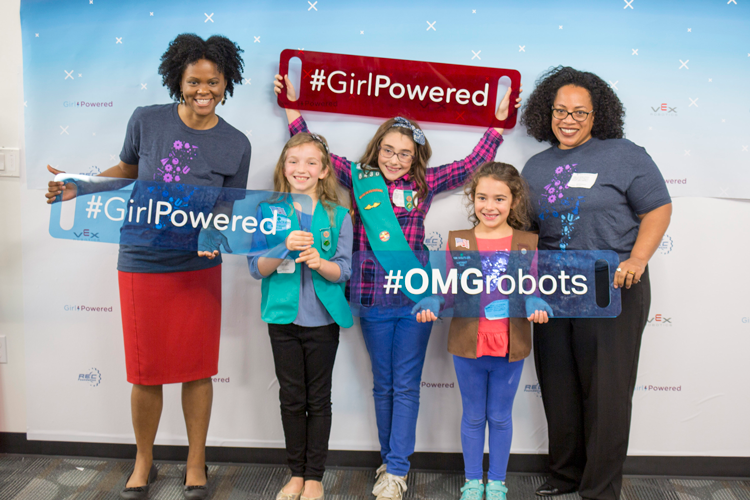 The Dallas flagship event took place this week at Texas Instruments, along with 100 other Girl Powered workshops spanning across the United States and the globe. These events coincided with the International Day of the Girl, adopted by the United Nations in 2011 to recognize girls’ rights and the unique challenges girls face around the world. The Girl Powered Flagship Event kicked-off with a panel discussion with technology thought leaders. Following the Q&A was a series of hands-on STEM activities for the students to try out including hacking a musical greeting card, a gak experiment, VEX IQ coding and speed build exercises, and the opportunity to drive competition robots. The panel discussion portion of the event was webcast out to the nearly 100 other Girl Powered events and can be viewed here, www.facebook.com/vexrobotics/videos. Event photos can be found here, www.flickr.com/photos/vexrobotics.